ARISE: Amelia Davis, young cartoonist of the future! Every year The CLAW selects one lucky “at risk youth” (at risk of being seriously awesome) and awards them the YOUNG CARTOONIST OF THE FUTURE Scholarship consisting of a over-sized novelty check for photographic purposes and a large sum of money. 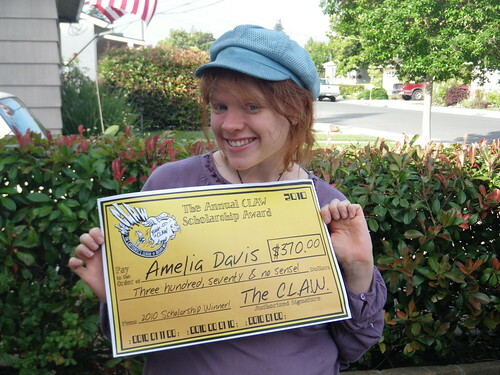 This year The CLAW was able to AWARD $370 dollars to Ms. Amelia Davis, an art student at Cogswell Polytechnical College in Sunnyvale, California. 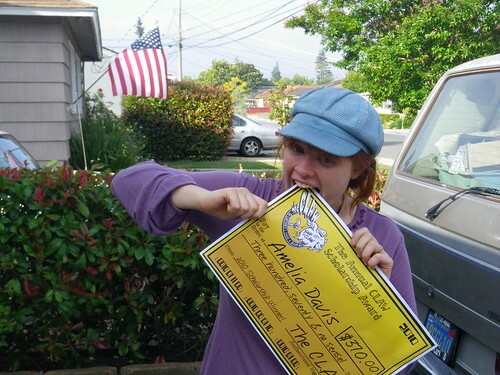 While Amelia tries to eat her novelty check, why don’t you browse her inventory of amazing illustration art here at http://lupis-fox.deviantart.com/ Yes!!!! Excelsior! Learn more about the CLAW scholarship and see past winners here.